Composed by Wolfgang Amadeus Mozart (1756-1791). Arranged by Malcolm Escott. Classical Period. 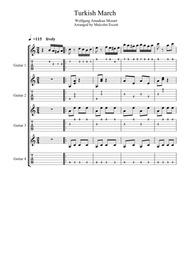 Score, Tablature. 8 pages. Published by Malcolm Escott (S0.164739). 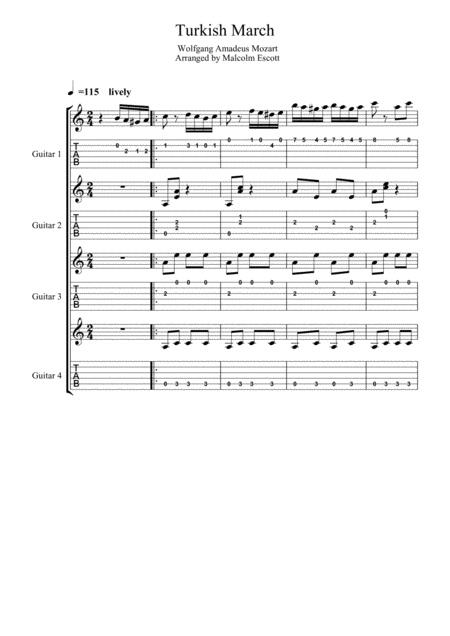 Mozart's Turkish dance arranged for a four guitar ensemble. With intermediate and advanced parts, ideal for a school ensemble or a GCSE / A level performance. .